Are you actually looking to use the neck tilt or just going for the look? If you're going to use the tilt, the plates are necessary, as they're what holds the tilt. The discs allow the adjusting screw something to push against, rather than just dig into the wood. The bigger screw closest the bridge is only partially threaded to allow for the adjustment. I think you would. If you take a look at the picture, the disc in the neck is what the screw closest the bridge attaches to. You could try and use the 3 bolt system without the neck tilt equipment, but it'd be less stable than the 4-bolt system. You could simply put the plate on and not have a plate under the two bolts closest the bridge. Two of the screws screw into the wood of the neck. The third is a bolt which fits into the threaded disc in the neck. There's a hole in the plate through which you can access the grubscrew which actually provides the shimming effect and is pressure locked by tightening up the bolt. If you are just planning to use the bolt hole for a wood screw into a standard 4-hole neck there wouldn't be any need for the discs on the body or the neck though you might need a shim. But why would you want to use a three-hole plate instead of a 4-hole plate? 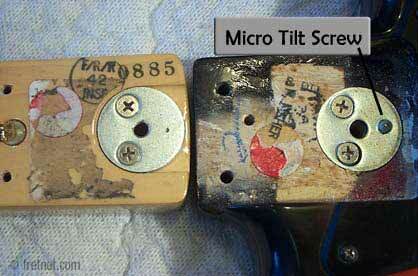 With the three-hole micro-tilt the bolt fixes into a disc that is held on by two screws into the neck.